Puttur, Feb 2, 2013 : “ The need of the hour is for elders to sow the seeds of literature in young minds which are averse to the habit of reading good literature,” said Dr Shimanthur A Narayana Shetty, veteran scholar. 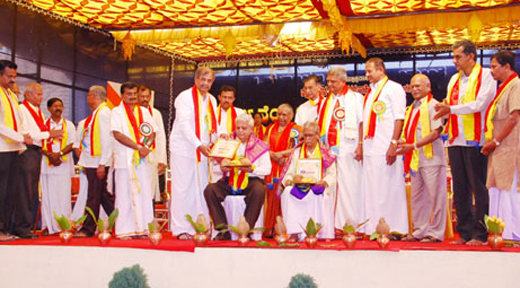 He was presiding over the 18th District Kannada Sahitya Sammelan organised at Uppinangady on February 1, Friday. Continuing, he said even Tulu language would have got its due recognition had there been a separate state called Tulu Nadu just as the four out of the five Dravidian languages have their own states. However, Kamala Hampana, veteran writer, who earlier inaugurated the conference, had to present an entirely different view on separate statehood.“ Today we are hearing demands from some corners to bifurcate the state. This is unacceptable and no Kannadiga should allow bifurcation of the state,” she said in her inaugural address. Continuing, she said the demand for a separate statehood for Kodagu or Tulu Nadu should not arise at all and stressed the need to work towards a Unified Karnataka. Commenting on the demand for education in mother tongue, Kamala Hampana said it is not education in mother tongue that is the need of the hour but education in the state language. Kannada Development Authority President Mukhyamantri Chandru, inaugurated the Art Exhibition and said the rural folks of Karnataka have contributed a great deal in protecting and preserving the uniqueness of the culture of the land. The exhibition was inaugurated by MP Nalin Kumar Kateel, while Puttur MLA Mallika Prasad inaugurated the book exhibition.Noted scholars Kainthaje Narasimha Bhat, Dr N Sukumar Gowda, Dr D Sadashiv Bhat, Dr Fr William Robert D’Silva, Prof.VB Arthikaje and Keshava Jogittaya were honoured on the occasion. Former Sammelan Chairperson Taltaje Vasanth Kumar, former District Sahitya Parishat President Harikrishna Punaroor, Udupi District Sahitya Parishat President Surendra Adiga, Kerala unit President SV Bhat, Puttur AC H Prasanna, D Harshendra Kumar, DK district Sahitya Parishat President Pradeep Kumar Kalkura, Puttur taluk unit President Varadaraja Chandragiri and others were present. Prior to the inaugural Kannada Bhuvaneshwari procession which was inaugurated by Uppinangady Gram Panchayat President Nalinakshi C Shetty passed through the main streets of the town.